Los Angeles critic Jason Rohrer and actor Todd Robert Anderson talk incessantly through cult films. 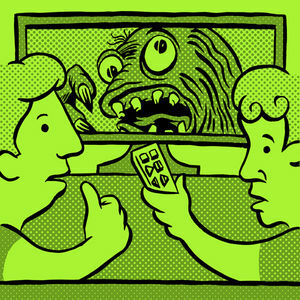 It would be annoying if you were trying to watch the movie, but this is a podcast...so it's just delightful! The Suckling is a movie about an aborted fetus that comes back from being flushed into the sewers to get revenge. Also, it takes place in a brothel. It's awful, but who cares, Jason and Todd have to talk about politics.